Last week we got our Baseball Express catalog in the mail and found a lot of interesting new 2014 model gloves. Perhaps most notable is what Rawlings has done. 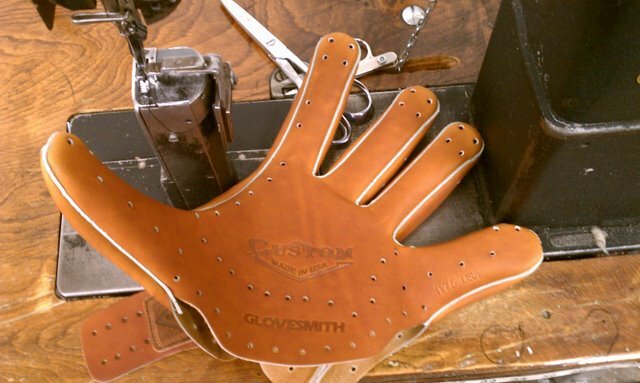 They are now selling a stock glove for $499 made of black "European leather", gold welting (! ), stitching accents like on the Primo, and red labels framed in gold. This glove is branded as the "new Rawlings Gold Glove." Stock numbers are RGG1175 (mod trap), RGG1200 (12" 2-piece), RGG1275H (H-web), and RGG2002 (11.5" I-web). Interestingly, these gloves are not for sale yet on Rawlings's own website, and only the 11.5 and 11.75 show up on the Baseball Express website. The name Primo seems to be on the way out. I'd be interested to know how closely the new Gold Gloves resemble the old Primo. They certainly look fantastic. With the name Gold Glove now used for the top gloves, Rawlings has also evidently renamed its $80-100 gloves as just "Gamer." HOH and PP seem to be unaffected. Someone over at SBF said they are basically Pro Preferreds with a $500 price tag. So they went solid core with them. I've tried one on. It's European Kip, not regular US Kip. Opti-Core is combining both Solid Core and the Dual Core. Both technologies have basically 3 layers of leather. On the dual core, the inner layer is basically a larger palm pad with position specific break points that helps the glove pocket break in for the position in which the glove is intended. Solid core is a 3 layer system as well that is made in which the leather is pre curved which gives you a glove that fits to your hand better and is a layering system as opposed to a shell with a lining inserted and then laced with pocket and heel lace to close the glove. So we have taken the dual core breaks and used them in the inner layer of the pre curved break points and came up with the Opti-Core hybrid. European kip is a younger steer that is smaller in weight and size. The leather actually comes from Europe and is very pristine in any type of surface damage. The lining, is Pittards Sheepskin laminated to deertanned cowhide and the fingerback lining is deertanned cowhide. One of the considerations that Rawlings wanted to conquer was the weight. These materials help them to get to a very lightweight glove. These are considerably lighter than the Primo line. It is going to be about 10% lighter than the Primo or HOH DC. I think I am going to pull the trigger on one in a couple of days. Thought I'd respond, as i just got a Gold Glove RGG1275 this weekend. Was shopping for an outfield glove among the usual suspects....A2000, HOH, PP, A2K, and my local store had one of these at a screaming deal, then, when I still hesitated, took another 10% off, and i was done. Basically, to me it blew away the other gloves. Felt stiffer, but more plush. Not heavy like the Primos. Seems to be thick in the palm, but in a good way, and forms to the hand quite well. Sort of like a Pro Preferred, but less lumpy, if that makes any sense. Would I pay the $499 that some websites are asking for it? No...but I don't think i'd pay that for any glove, as they get used by me or my sons as tools, not collectables. Both my son and I thought this glove was far and away the best that we tried on(out of about 20-25 HOH and higher level gloves) that we tried on our buying trip. It came down to this one an HOH H web that felt particularly nice. Doesn't seem like there is a lot of chatter out there about these gloves. Mine had the Red labels rather than the Gold...if our local glove repairman can't fix my son's infield glove(Spalding 42001) we might go on the hunt for one of the infield versions.